Another deliciously simple Passover recipe that's healthy, filling and light! Preheat the oven to 350°F and line a baking tray with parchment paper. Arrange the sweet potato slices on the baking tray. Drizzle with olive oil, salt and pepper. Roast sweet potatoes for about 20 minutes. Remove from the oven. 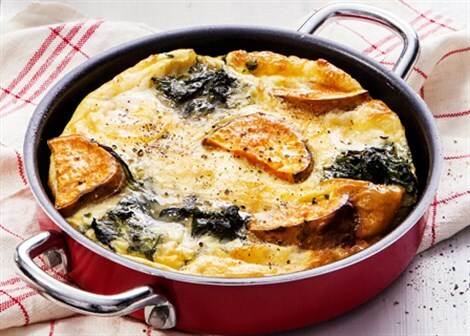 Heat up 1 tablespoon of olive oil in an oven-safe frying pan. Add the roasted sweet potato slices, spinach and basil leaves. Cook gently on a low flame. Beat the eggs well and season with salt and pepper to taste. Mix in the shredded cheese and gently whisk together with the eggs. Fry the eggs together with the vegetables on a low flame for five minutes. Transfer into the oven and bake for about 10 minutes until the cheese is melted and the frittata is toasty. Pesach is a time of family and food. Lighten up the week-long holiday with these fresh dairy recipes from Tnuva. Using only wholesome ingredients, these recipes created by a leading Israeli chef give a special flare to the upcoming holiday. All Tnuva products mentioned are available Kosher for Pesach at local kosher grocery stores across North America.